**Please note: Every Friday starting Memorial Day and ending Labor Day we have our CBVR BBQ on the patio from 9:30 to 1:30. As our guest, you are more than welcome to join us. Distractions, be gone! If you’ve been contemplating a solo trip to the coast to finish that novel or long-neglected research project, look no further than The Bungalow. Secret yourself away here for a weekend work retreat, and let the inspiration flow. 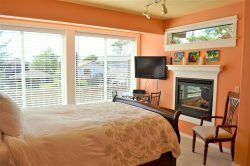 This gorgeous, brightly cast one-bedroom cottage is located in Cannon Beach’s Midtown area. This means you’ll have easy access to all the basic amenities you’ll require, but you’ll be far enough from the bustle of downtown Cannon Beach that noise and action won’t distract you from your mission. Prepare to be charmed as soon as you open the front door: the up-to-date interior is fresh, clean and full of fun surprises. The living room features a plush sofa, plus a gas stove to keep you cozy as you work or relax. There is a flatscreen TV nearby, perfect for popping in a film at the end of a long day’s toil, plus Internet access, great for any work-related research needs. When mealtime arrives, unkink those shoulders and cook to your heart’s content in the new, fully-equipped kitchen. You’ll find everything you need here to keep replenished, including a gas stove, colorful décor and lots of light to sooth your tired senses. When it’s time for a break, sit a spell on the small back deck, gaze out over the quiet yard, and let the fresh air and breezes flowing in from the nearby ocean revive your senses. Then, throw some brain food on the BBQ grill. You’ll need that sustenance as you chip away at your masterpiece. Still feeling antsy? Head out for a walk along the beach — it’s located right nearby — and then get home and back down to business. When night arrives, you’ll relish sinking into a lovely queen-sized bed with new linens in The Bungalow’s single bedroom. A bathroom with shower is also on hand. This heavenly little bungalow is an ideal retreat space, whether you’ve come to work, to play, or to do a bit of both. Who needs a muse? When you’ve got the beautiful North Coast as your backdrop, inspiration always comes easy. Cannon Beach Vacation Rental offers these other nearby homes as well: Haystack Roost, and Elliott Way. Lovely bungalow and excellent staff...qe will be back! We had a great time, good value, great location, we will look to use this or another property again. Thanks! Excellent. Coffee from Sleepy Monk, Coupon and doggie treat and bags are all great perks!